After seven decades in practice, Henry Cobb has published his first collection of essays, interviews, lectures, and projects: Henry N. Cobb: Words & Works 1948–2018. 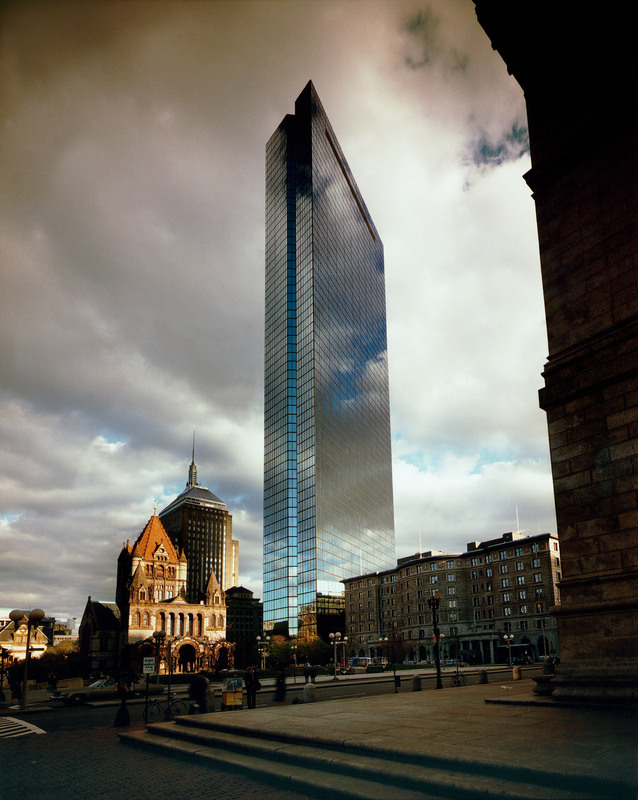 The story of his best-known building, Boston’s John Hancock Tower (now 200 Clarendon), follows a dramatic arc from the controversies of its public review and construction to its recognition as a beloved icon of the city. Our proposal was not well received. Indeed, the response in Boston was one of shock and horror. What we saw as the right building in the right place at the right time was seen by almost everyone else, and above all by our fellow architects in Boston, as the wrong building in the wrong place at the wrong time. But after nine months of acrimonious public debate, the necessary permits were obtained, and in the fall of 1968, construction began. Permission was granted not because I had succeeded in converting people to our way of thinking—for with only a few exceptions, I had not—but because had a building permit been denied, the Hancock company might well have carried out its threat to move its headquarters, with its 12,000 employees, to Chicago. This brazen exercise of corporate arm-twisting on the part of our client naturally contributed to the widespread opinion, often explicitly conveyed to me in person, that my colleagues and I had prostituted ourselves professionally in accepting and carrying out this commission. To compound the agony, during construction the building endured a series of mishaps that caused us and our client to experience the rare privilege of being, for almost half a decade, simultaneously despised and ridiculed. 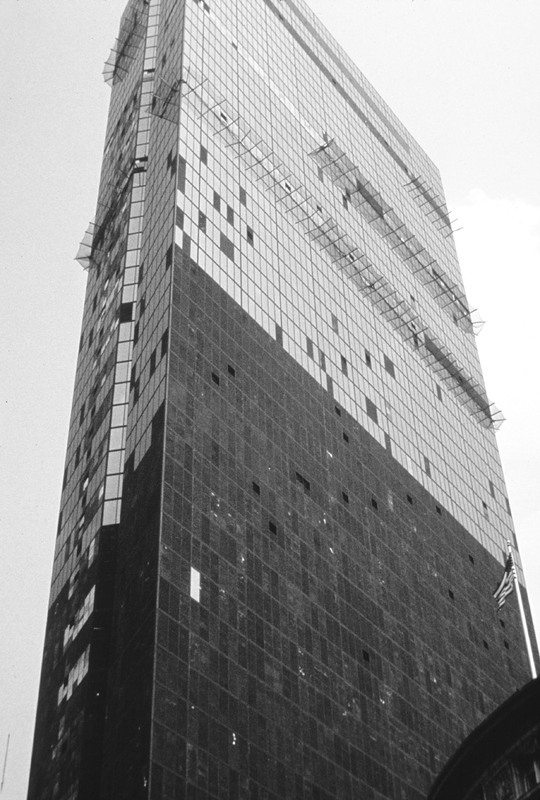 The most notorious of these problems, publicized worldwide, was the failure of insulating glass units that necessitated removal and replacement of all 10,334 panels in the curtain wall. Many in Boston saw all this as entirely just retribution for the egregious overreaching of the city’s largest corporation. Mercifully, however, an entrepreneurial T-shirt artist didn’t lose his opportunity to find a lighter side, with which I was able to outfit all three of my daughters in the otherwise miserable summer of 1973. 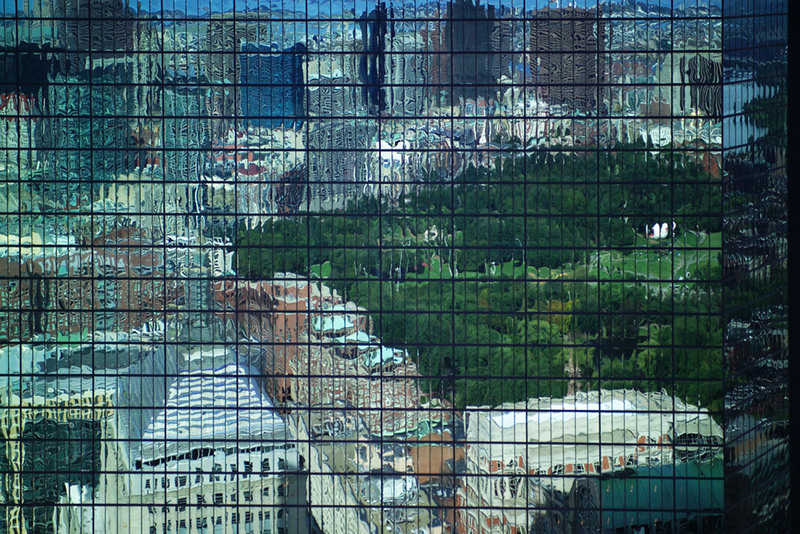 Although the deceptive mutability of its image may suggest otherwise, there is nothing mysterious about the design of the Hancock Tower. It perfectly illustrates my view that the architecture of a tall building is 99 percent logic and 1 percent art—but don’t you dare take away that 1 percent! The extreme disparity in size between the tower and the church was the central predicament we faced. We chose to deal with it not by creating a gratuitous distance between the two—this would only have exacerbated the problem—but by bringing them into close proximity while positioning and shaping the tower in such a way that it becomes the contingent satellite and the church the autonomous center in the composition. To accomplish this, several aspects of the tower’s design may be cited as essential. First, the attenuated rhomboid plan-form, placed diagonally on its site, emphasizes the planar while minimizing the volumetric presence of the building, so as to effectively disembody the tower as seen from the square. Second, a bullnose corner detail facilitates the crucially important transition from trapezoidal base to rhomboid tower. Third, notches bisecting the end walls accentuate the weightless verticality of these planes and make legible the tower’s nonrectangular geometry. Fourth, the tower’s uniformly gridded and reflective surface, stripped of all elements that could suggest a third dimension, mutes the obtrusiveness of its enormous bulk and defers in all respects to the rich sculptural qualities of its much smaller neighbor. Fifth, rather than standing on the ground, the tower’s rhomboid volume slips weightlessly up out of the surrounding granite pavement, from which it is separated by a 1-inch-wide perimeter slot. Finally, the triangular space created between the church and the broad face of the tower pays homage to the apsidal view of Richardson’s building, reinforcing its intended role as the architectural cynosure of Copley Square. With regard to this latter aspect, it should be noted that the three-story lobby at the base of the tower is sheathed in precisely the same manner as all other floors; had the monumental scale of this space been directly exposed to view, it would surely have destroyed the delicate balance in the dialogue between church and tower. This concern also accounts for the modest scale of the three entries, originally sheltered by clear plastic domes, which were subsequently replaced by an attenuated stainless-steel canopy. Truth be told, the tower’s reflective surface and reticent posture do not invite entry. I used to joke with my colleagues—but not with our client!—that the proper means of gaining access to this impenetrable monolith would be through the porch of Trinity Church and along the nave to the crossing, where one would turn and descend by escalator into a tunnel below the street and emerge, finally, in the tower’s elevator lobby. We adopted a strategy of minimalism in the design of the Hancock Tower not for ideological reasons, but because the situation of the building demanded it. In the determined pursuit of our goal—to achieve a symbiosis between the church, the tower, and the square—we excluded everything that did not contribute directly to this end. For we believed that only thus could we temper the inherent arrogance of so large a building and endow it with a presence that might animate rather than oppress the urban scene. Can this accommodation justify that transgression? Is this performance appropriate to that occasion? Does this tower belong in that city? To each of these questions the answer, it seems to me, must finally be both yes and no. This persistently disturbing ambiguity, in which the building discloses the anxiety of its predicament, perhaps explains why, among all my built works, the Hancock Tower is as close as I have ever come to poetry. It is also as close as I have ever come to silence. The building’s restraint to the point of muteness, its refusal to reveal anything other than its obsession with its urban context, is surely its greatest strength but also its ultimate limitation as a work of architecture. Despite the forcefulness of its gesture, the tower remains virtually speechless, and this resolute self-denial is, in the end, both its triumph and its tragedy.